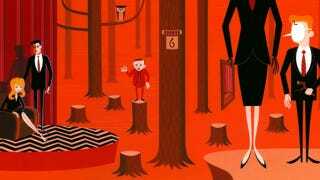 This is, excuse me, a damn fine Twin Peaks inspired art exhibit. Come celebrate the 20th anniversary of David Lynch's Twin Peaks: Fire Walk with Me with this horrifically gorgeous collection of Twin Peaks art! Artists from across the globe submitted their best paintings, prints, and sculptures of Bob, white horses, train dioramas and more. The entire show will be on display at the Copro Gallery, Copro Gallery in Santa Monica, CA from April 21 to May 12 — but even if you can't make it to California for the big reveal, the gallery has put up a collection on their exhibit online right now. Here are our favorites from among the surreal, bewitching images.